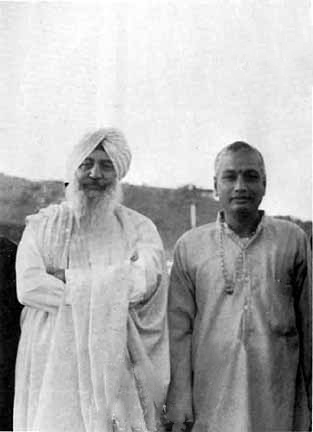 What better place to start a series of photographs of Swami Venkatesananda with World Teachers and spiritual leaders than with the teacher that was most significant to him, that of his own guru and master, H.H. 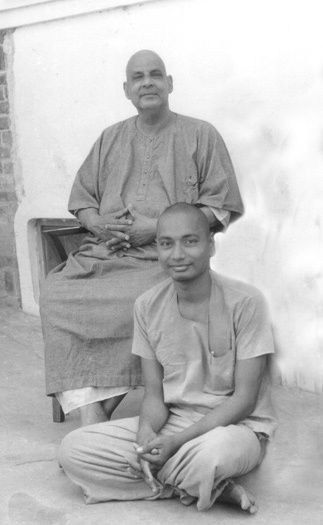 Sri Swami Sivananda. Is any relationship ever as intense and important as that? Surely none can compare. Swami Venkatesananda, as some may know was renowned for his reverence for all teachers, but had a special reverence for the divine mother, as evidenced by his yearly Durga Puga. He would often talk about Durga and the invincible power of Shakti, and with him, it was not just talk; it was sincere. 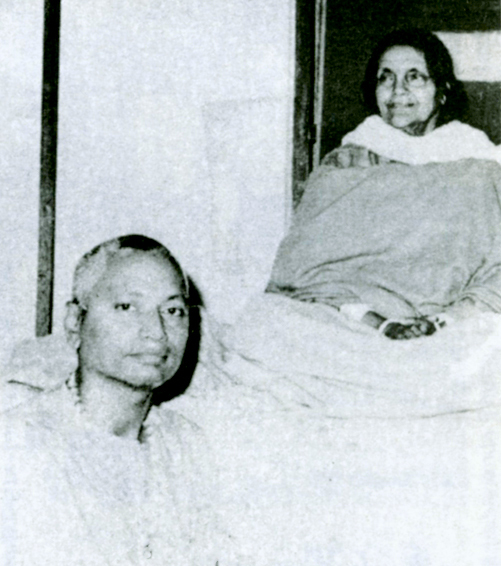 Here he is at the feet of spiritual luminary, Sri Anandamayi Ma., considered to be one of the great women saints of the 20th Century. The photograph is certainly of poor quality, but it does give us a glimpse of Swami Ramdas (known as Papa Ramdas to some), who, along with Swami Sivananda, was considered one of the greatest saints of Indian living in the 20th Century. Swami Venkatesananda was immensely fond of the manner in which Swami Ramdas sang the Sri Ram, Jai Ram Kirtan, finding it simple, direct and immensely powerful. To hear him sing it, and a few recordings of him chanting it, is a very powerful experience indeed! 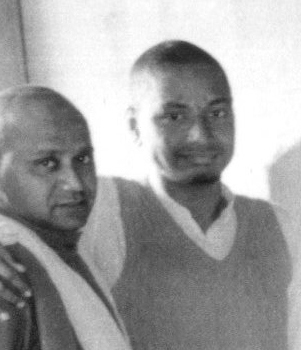 Swami Venkatesananda was to later meet Papa Ramdas' grandson, Prem Trikannad, who came to sing devotional songs at the Sivananda Yoga Centre in Los Angeles during Swami Venkatesananda's visit in the early 1970s. With A. C. Bhaktivedanta Swami. A. C. Bhaktivedanta Swami Prabhupada was the founder and initial inspiration behind the International Society for Krishna Consciousness, what most of the West knows as the Hare Krishna Movement. And while Swami Venkatesananda may not agreed that going out into the streets to convert people to be followers of anything was such a good plan, even if that conversion attempt had the lofty aim of Krishna Consciousness, Venkatesananda did have great affection for the practial wisdom to be found in scripture known as The Bhagavad Gita, and it seemed quite fitting to pay his respects to Bhaktivedanta for his celebration of Krishna. 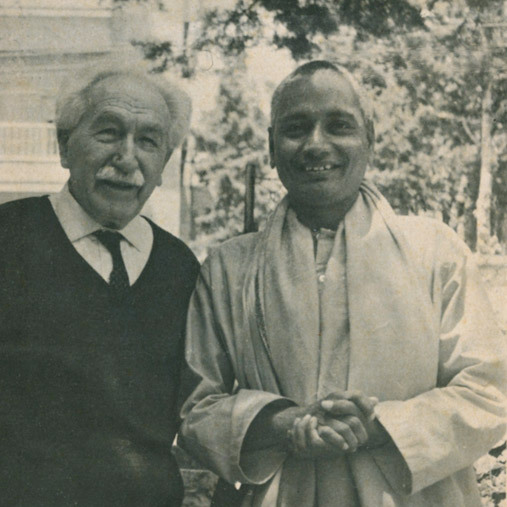 Krishnamurti, the reknowed international speaker and author, and Swami Venkatesananda, the Swami without his own spiritual organization, were close friends for many years, and it remained so until the end, with Krishnamurti's death happening only some four years after Swami Venkatesananda passing. 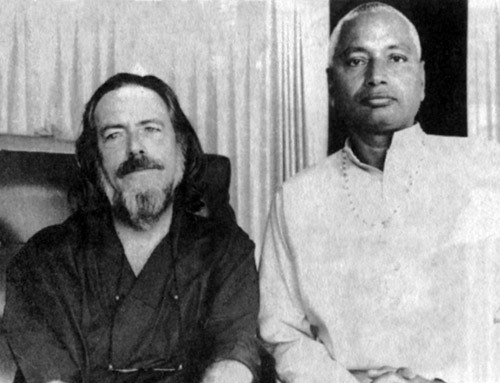 It can be noted that neither Krishnamurti, nor Swami Venkatesananda desired to pass themselves off as a "guru." 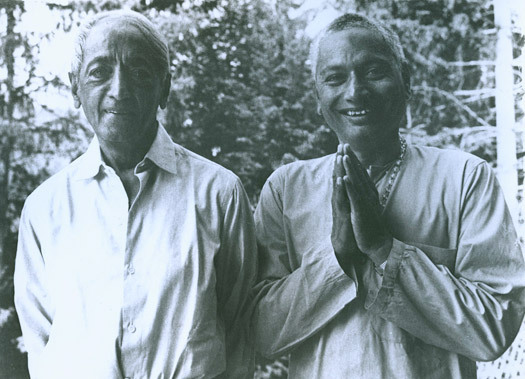 Krishnamurti detested the entire notion of leading a spiritual organization, and Swami Venkatesananda, while he would wish his friends the best of luck if they wanted to start a spiritual organizations, he managed to dodge having an organization of his own. The closest he got to that was to agree to come visit and give talks on yoga for friends who had started an organization of their own. In that regard, he was even less compromising that J. Krishnamurii who allowed a foundation to be created in his name. The ever vigilant Swami managed to avoid that situation altogether! This close friendship between these great sages, if we may call them so, will surprise some, since Swami Venkatesananda is so well known for translations of Indian Scriptures, like The Bhagavad Gita or the Yoga Vasistha. 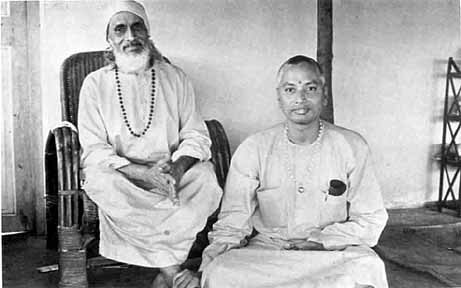 However, those who knew both Krishnamurti and Swami Venkatesananda were not at all surprised by great affection for each other. For both sought to clarify at every opportunity that it is the responsibility of each individual to become a light unto himself/herself; and that it is senseless and useless to lay that responsibility at the feet of others. Both attempted to shed light on the total uselessness of a conditioned mind, and both attempted to shed light on how we, as human beings, might find a way to become absolutely and unconditionally free. There were certainly more similarities between them than there were differences, and it seems, they both had the presence of mind to recognize the bond that connected them as "brothers." Neither one presented themselves to the world as a guru or even to those who saught to be their followers. It was no surprise then to see them laughing as they together sat arm in arm, feeling the strong bond of their spiritual kinship. Kirpal Sing (1894-1974) had quite a noble mission:"My mission: To fill the human heart with compassion, mercy and universal love, which should radiate to all countries, nations and peoples of the world. To make a true religion of the heart as the ruling factor in one's life. To enable each one to love God, love all, My goal is that of oneness. I spread the message of oneness in life my life, and I pray that it may be fulfilled." Certainly that seems to echo Swami Sivananda and his mission also. 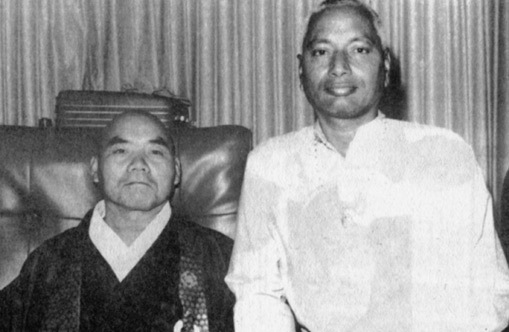 Swami Venkatesananda meeting with H. H. The Fourteenth Dalai Lama in Western Australia in 1982, meeting with him in order present the Dalai Lama with Swami Venkatesananda's last and final publication, "The Supreme Yoga - The Yoga Vasistha, and Swami Venkatesananda's edition of Buddha Daily Readings. Swami Venkatesananda had a life long interest in stories of the Buddha, and would often discuss The Buddha in his lectures on yoga. Needless to say, he was quite overjoyed to have an opportunity to meet with the Fourteenth Dalai Lama in Australia, and brought some of his friends, young and old to hear him give a lecture "The History of Buddhism," in Perth, Australia, where this photo was taken. With author and lecturer Alan Watts in California in 1972, not long before Watts' passing in 1973. For those that missed Watts in the 50s and 60s, and have yet to catch up on him, Alan Watts was one of the first Westerners to popularize Zen in the West, starting with his first book in 1936, The Spirit of Zen, and ending with his unfinished work: Tao, The Watercourse Way," which was finally published in 1975. Audio recordings from remarkable TV Series for Public Television may be found online. Many westerners find Alan Watts provides an magnificent introduction to the Eastern Mind and to Zen Buddhism. K. S. Iyengar, the founder of Iyengar Yoga. Many may not realize that Swami Venkatesananda practiced Hatha Yoga daily for most of his life, and had a keen interest in it. At the time this photo was taken, Hatha Yoga was just beginning to become popular in the West, and along with Swami Vishnu, B.K. S. Iyengar was one of the one of the leading pioneers who popularized the teachering of Hatha Yoga in the United States. Much like Swami Vishnu-Devanana, Iyengar helped encourage his students to go on to teach others. Though the number of their own students may only count in the thousands, there is no doubt that hundreds of thousands of people world wide now have yoga in their lives due to his Inyengar's efforts, and even more to the teachers that he himself trained in particular style of yoga. 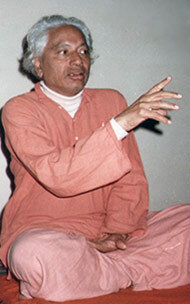 Teacher, which in turn, now train other teachers now that Iyengar is gone, many with a new yoga of synthesis. Teachers such as Ganga White, of White Lotus Foundation, for example, who studied with Iyengar, as well Swami Venkatesananda, and now spends most of his energies training a new generation of yoga teachers. 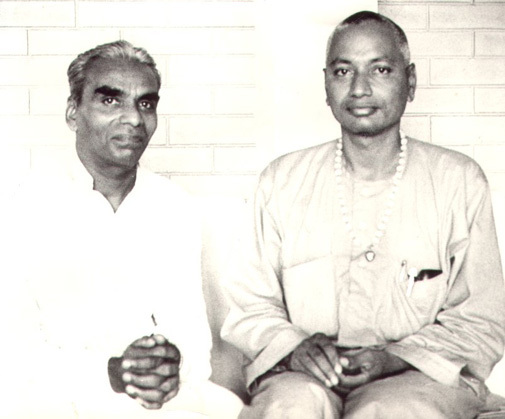 Swami Venkatesananda and Swami Krishnanada were brother disciples both serving the same master, H.H. 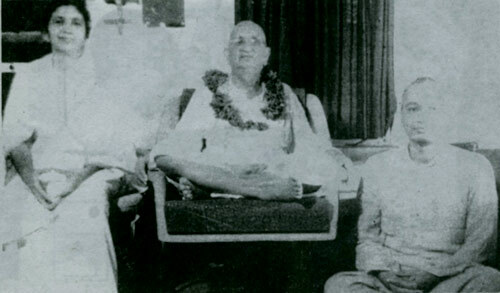 Swami Sivananda. Like Swami Venkatesananda, Swami Krishnanda was very well versed in Sanskrit from an early age, and similarly devoted time to editing and writing. And he, like Swami Venkatesananda was regarded as a brilliant philosopher and, more importantly, a great yogi. 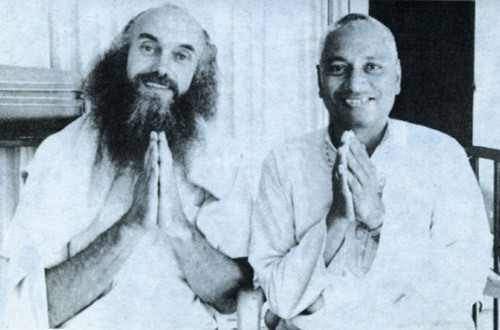 Swami Prabhavananda, a monk in the Ramakrishna Mission and spiritual head of the well known Vendanta Society in Southern California met up with Swami Venkatesananda in 1972 at the Los Angeles Vedanta Centre. 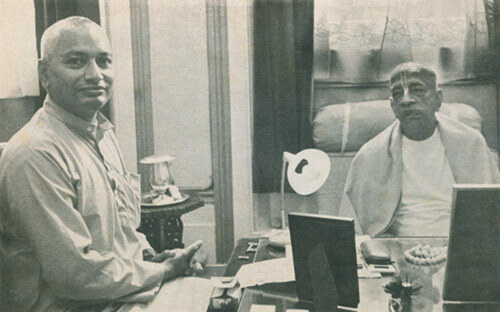 At the time of their meeting both Swami Prabhavananda and Swami Venkatesananda had both completed their own translations of The Yoga Sutra of Patanjali, Prabhavananda's version done in partnership of Christopher Isherwood, and remains to this today, one of the more widely known and read versions. Although that version is very different from Swami Venkatesananda's version, Swami Venkatesananda wanted very much to pay his respects to Prabhavananda. 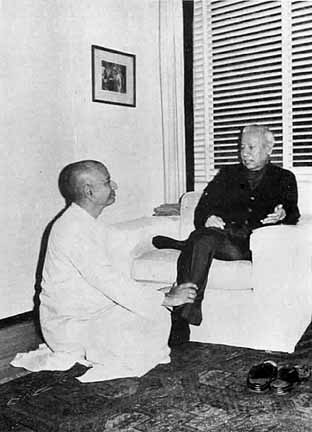 Note that Swami Venkatesananda sat in his favorite position, not only below, but at the feet of a another yogi. In this manner, he taught many of us that humility is one of the purest and perhaps even highest of virtues. Furthermore, there was not a trace of pride in its performance on his part, another aspect that was worthy of note. Roshi Sasakio is a Japanese Rinzai Zen teacher who founded a Zen Center in Los Angeles. He may be best known for being the teacher of poet and song writer Leonard Cohen. At age 104, he was still actively teaching at the age of 104 at a variety of Zen centers including the Mount Baldy Zen Centre, the Bodhi Manda Zen Centre and Rinzai Zen Centre. Swami Venkatesananda great love of Buddha's teachings made him genuinely interested in meeting all those who sincerely interested in meeting any monk who was a sincere follower of the teaching of the Buddha. 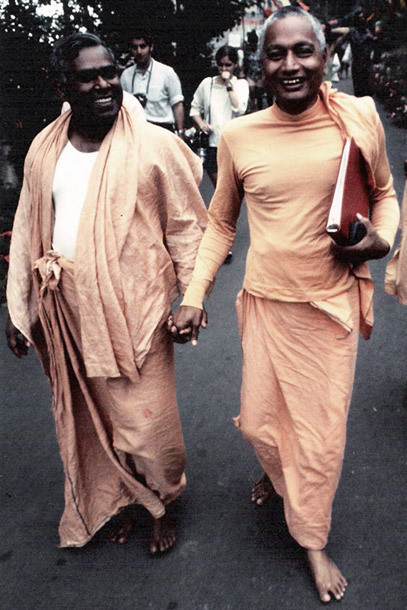 As stated on Nityananda.net, Swami Muktananda and Swami Venkatesananda were indeed spiritual brothers and colleagues. They met in the late 1960s, and stayed in touch from then until the time of their deaths - exactly two months apart. 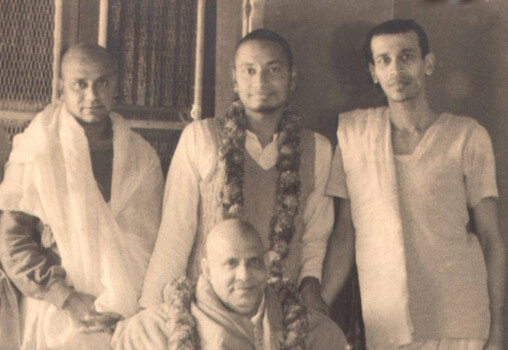 A lovely photograph of Master Sivananda (seated) with three of his most senior disciples. 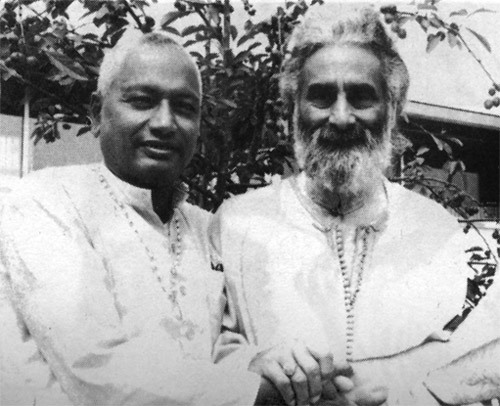 Standing from right to left: Swami Krishnananda, Swami Venkatesananda and Swami Chidananda (who became the head of the Divine Life Society after Master Sivananda's Maha Samadhi in 1963) and ran the Divine Life Society until his own Maha Samadhi in 2008. Here with Swami Vishnu-Devananda at Swami Vishnu's World Peace & Music Festival in Quebec, Canada. 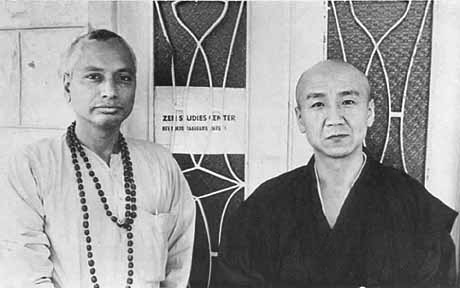 Swami Vishnu, also a disciple of Swami Sivananda, was the founder of the Sivananda Yoga & Vedanta Centers in North America, and whose well known book, The Complete Illustrated Book of Yoga, helped popular Hatha Yoga in the 1960s and '70s before there were yoga centers on nearly every block in Los Angeles. Swami Vishnu-Devananda continued to look for ways help foster world peace. Perhaps his greatest contribution towards that end was to encourage so many young people on the path of themselves, and create yoga centers where they could train students of their own. Known as "The Philosopher President," Dr. S. Radhakrishnan was the first Vice President of India (1952-1962) and the second President of India from 1962 to 1987). Before taking a government role, he taught Ethics at Oxford University, and he certainly earned his position as an Indian philosopher and statesman, and his title as one of the most influencial academic scholars in public life. 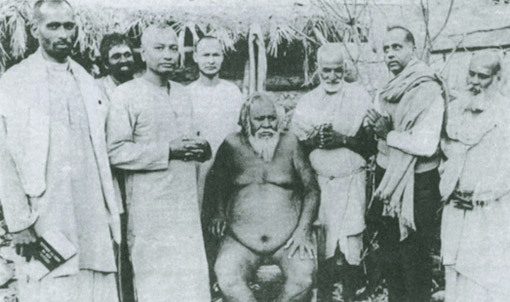 Swami Venkatesananda with an unidentified holy Avadhuta (naked ascetic) of the Himalayas. 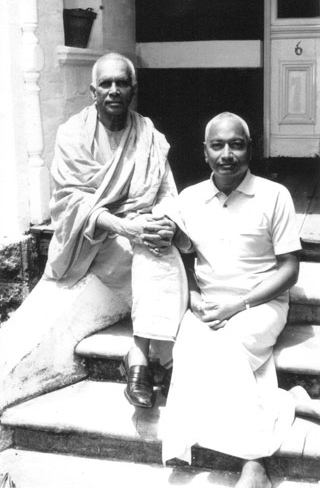 Swami Venkatesananda with V. V. Giri, the fourth President of the Republic of India. 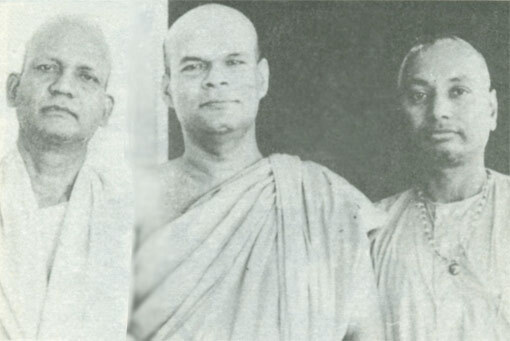 Former President Giri worked in government was active in government for quite a long time before he became President, and it is not known whether he knew Swami Venkatesananda bedore he became a swami (Swami Venkatesananda also used to work in the government before renouncing the world). 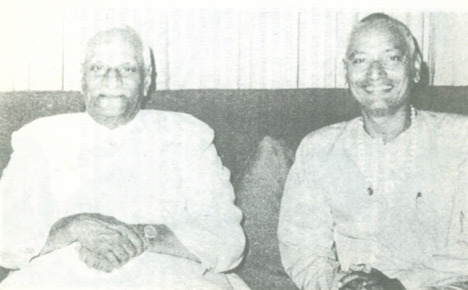 Giri's work was primarily in labor relations, while Swami Venkatesananda's work in governnment was in the diplomatic service, where he also worked with high ranking government officials. Not to be confused with Swami Papa Ramdass, Baba Ram Dass, (even though it is more likely that most of you will know latter over the former), also known on the Interwebs as simply Ram Dass, and earlier as Richard Alpert, when he was a successful professor of psychology at Harvard, where his interest in LSD led him to author The Psychedelic Experience: A Manual Based on The Tibetan Book of The Dead. After meeting his first spiritual teacher, Neem Karoli Baba, he then returned to North America to continued writing, producing many books on the inner journey, beginning with Be Here Now which was the transcribed lectures have gave upon his return to the West, and which he initially gave away for free via the Hanuman Foundation, and The Only Dance There Is, and lesser known titles like Grist For The Mill, Be Love Now, How Can I Help? and Still Here. 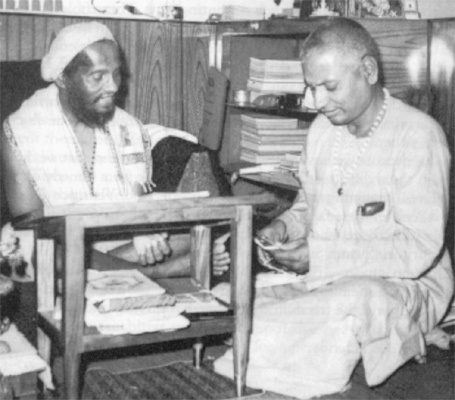 Baba Ram Das first met Swami Venkatesananda in Los Angeles at the Sivananda Yoga Vedanta Centre while he was traveling with Baba Muktananda on his first wold tour in 1970. The two nearly tackled each other trying to the first to bow and show reverence. It was both touching and comical at the same time, and everyone burst out laughing (including both of them) at the one nearly tackling the other in an act of reverence. The son of Hazrat Inayat Khan, head of the Sufi Order International, Pir Valayat Inayat Knan eventually inherited that mantle, and became head of the Sufi Order, and traveled the world teaching the highest ideals of Sufism, along with his own variation of Sufi Universal Worship that much like Swami Sivananda's satsang kirtans, included prayers, sayings and songs from all the major religions of the world, all together in one service. His the author of many spiritual books, Awakening: A Sufi Experience, In Search of Hidden Treasure, Life Is A Pilgrimage, and others, along with perhaps his best known work, Toward The One. In addition to being a great spiritual teacher, Pir Valayat was an excellent classical violinist, and conductor. And, as if his own teachings weren't inclusive enough through his ecumenical approach, he even managed to successfully bring music into teachings and his workshop settings. On one occasion, after a long discussion on the power of sound, mantra and breathing, he decided that a short break was necessary so that students could all stand up and stretch. He accomplished this as only Pir Vilayat could. He mentioned that he was returning to Paris in a few weeks to conduct the Bach B Minor Mass, and suggested that best way to get a good stretch would not be just to stand up and move around, but to do it to music, by practicing conducting along with him. Then he had somone put the Bach B Minor Mass on the auditorium speakers, and had everyone stand and "pretended" to be conducting the music along with him. His enthusiasm, and his light and open-hearted approach instantly made others receptive to his message of universal peace wherever he traveled. Certainly it was no wonder Swami Venkatesananda was delighted to spend time with him. He was an inspiration to everyone who came his way. A long time good friend of Franz Kafka, and a translator of several books by Rudolf Steiner, Hugo Bergmann an Israeli Professor and philosopher who managed those varried interests as author, translator and professor with great distinction, and whose writings, whether in the field of physics, quantum mechanics and causality, or even his published thoughts on Zionism always had a core focus on social justice and world peace. It was Bergmann together with associate Martin Buber, for instance that helped found the Brit Shalom movement , which strove to create an area in Israel where Jews and Arabs would be able to live together with equality and fairness. To say that Bergmann was ahead of his time would certainly be an understatement. 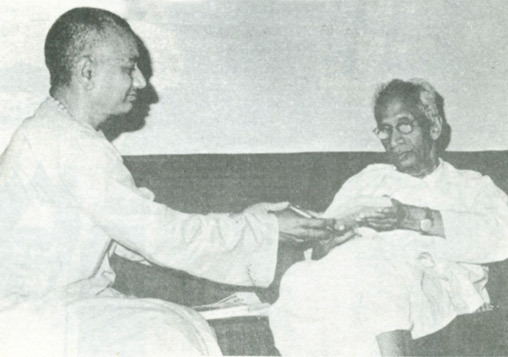 Swami Venkatesananda with Marahraj Charan Singh. 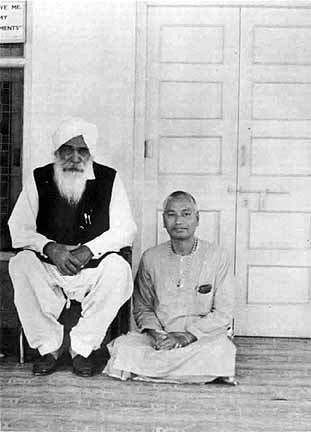 Not to be confused with one of the Prime Minister's of India, this Charan Singh was a Sant Satguru who became the fifth Satguru of Radha Soami Satsang Beas an order which fostered a philosophy based on the teachings of mystics from all religions. Swami Ranganathananda, the head of the Ramaskrishna Mission, (he served as the 13th President of that organization) was by all accounts a brilliant scholar and teacher, and the author of over 50 books, including commentaries on the"Bhagavad Gita" and "Upanishads" and perhaps his most well known publication, Eternal Values For A Changing Society. 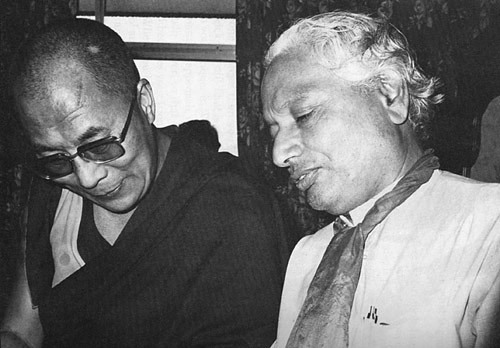 Swami Ranganathananda was the recipient of the Ghandi Peace Prize, and lectured all over the world. It should also be mentioned that he also wrote the Forward for Swami Venkakesananda's The Supreme Yoga, A New Translation of the Yoga Vasistha, which was retitled Vasistha's Yoga, and is available from SUNY Press online here. Dharma heir of the late Soen Nakagawa (no familial relation), Roshi Kyudo Nakagaw was the head of the Soho Zen Buddhist Society in Manhattan (NY, NY), and also occasionally, when in London, also led The London Zen Society. 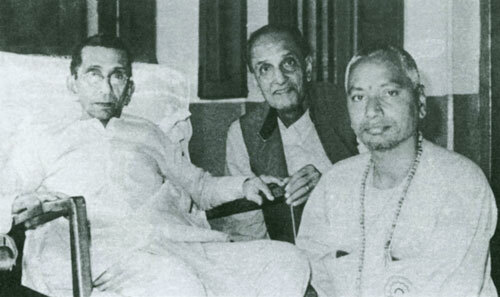 Swami Vireshwarananda (seated left) was the tenth President of the Ramakrishna Math & Ramakirhna Mission. He was regarded as a great scholar and translator of sacred Sanskrit texts. Not much of his work remains available, except for his transation of the Bhagavad Gita. Swami Venkatesananda has also translated the Bhagavad Gita, and you may find the Swami Venkatesananda edition online here on this site. Dr. Shuddhananda, also known as Yogi Suddhananda, was regarded as a mystic poet who wrote several hundred works in English, French, Tamil, Hindu, Telugu and Sanksrit; thousands of songs, and well over a thousand poems. His "Bharata Shakti" describefd as his "magnum opus" contains over 50,000 verses alone. Swami Sivananda bestowed upon him the title of Maharishi in 1954. He is said to have revived some ancient yoga techniques under the banner of Sama Yoga for which is also widely known. However, he remains best known for his poems and other writings, which include dramas, operas, codedies, novels, biographies, and essays. His own autobiography, The Pilgrim Soul, includes his own brief encounters with such luminaries as Annie Besant, Sri Aurobindo, Ramana Marahshi, and, of course, Swami Sivananda, and his disciple Swami Venkatesananda. With Venerable K. Dhammananda There, Chief Buddhist High Priest in Malaysia (center) and Swami Prananvananda, President of the Divine Life Society's Malaysia Branch (left).